Or, where in the world did that idea come from? Designing jewelry involves “playing” with the stones, beads, and metal, moving the elements around until the arrangement feels right. This creative process is both intuitive and purposeful but it’s best not to be judgemental too early. This allows time and space for surprises and unusual things to unfold. Getting into a creative flow means there is no thought of hunger or tiredness – and certainly no room for boredom. The result is happy exhaustion and a lovely array of necklaces, earring, bracelets, and small purses on my work table. 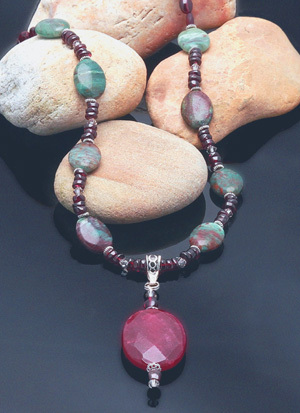 Part of the joy of making jewelry is handling the beads, stones, and metal. Each material has its own unique tactile quality. I love the feel of the stones and beads as I move them under the light. The metals that I use are very light weight and the smallest chain sometimes feels like liquid as it slips through my fingers.